Marylebone Gin is a popular Gin available from Amazon.co.uk in 70cl to buy online. Visit Amazon.co.uk for the best price for 70cl of Marylebone Gin or compare prices on our other Gin products. A classic London dry gin produced in London and sold primarily in the Marylebone district. A delicate and complex gin, bursting with floral overtones, with a strong Juniper, sweet citrus and grapefruit taste leading into more intense floral and citrus notes. A beautiful warming finish with notes of cassia, cloves and licorice. Perfect with a lime slice or pink grapefruit served in a large balloon glass with lots of ice. Where to buy Marylebone Gin ? Marylebone Gin Supermarkets & Stockists. 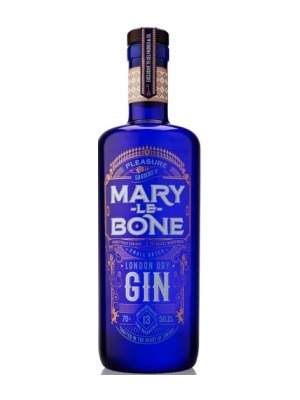 You can buy Marylebone Gin online in most retailers and find it in the Gin aisle in supermarkets but we found the best deals online for Marylebone Gin in Amazon.co.uk, TheDrinkShop, 31dover.com, DrinkSupermarket.com, and others. Compare the current price of Marylebone Gin in 70cl size in the table of offers below. Simply click on the button to order Marylebone Gin online now.